EXTENDED OPENING FOR HOLIDAY SHOPPING! To assist our customers with their holiday shopping we are opening the tasting room for bottle purchasing from 12 p.m. to 5 p.m. Monday, November 27th through Thursday November 30th. We will be open normal hours (noon to 6 p.m.) on Friday and Saturday December 1st & 2nd. Our “Captains” Gluhwein is available this week. The tasting room will close for the season December 3rd and will reopen in April 2018. During this time bottle sales are available by appointment. Please call us at (828) 837-7822 and arrange a time for your purchases. Thanks to all for a FANTASTIC YEAR!! for tasting on the 21st, and 22nd . This wine is a three way blend of white wine from the Fantastic 2016 Vintage. It is a true Alsatian (Old World) style wine. We just removed it from the European Oak Barrels last week. We will continue bulk-aging it until this fall. Sometime this fall we will bottle it, and decide upon a name and a label for it. Release date is scheduled for April 2018. So come on out and get a sneak taste of this one of a kind wine. Karen and I look forward to your visits, and serving you this year. Mark Your Calendar … Opening for the Season April 21! Come out and join us as we open for the season on Friday April 21st, 2017! The Tasting Room is closed for the season. We will reopen for tastings in April 2017. Bottle sales are available by appointment; call 828-837-7822 and leave a message and we will contact you, or contact us via our online form. Thanks for making this a fantastic year. We look forward to serving you next season. We’ll be Open Memorial Day! 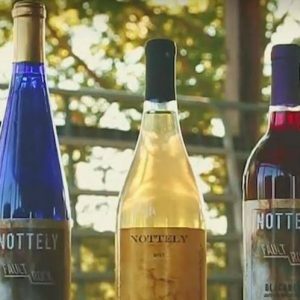 Nottely River Valley Vineyards will be open Monday, May 30 from Noon to 6 p.m. in observance of Memorial Day. It is almost time for our opening this Friday, April 29, 2016 at Noon. 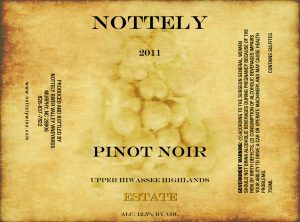 We are RELEASING the following wines: 2011 PINOT NOIR, LIMITED PRODUCTION: and our 2015 PINOT GRIS, VERY LIMITED PRODUCTION! We are also releasing the: 2013 Chambourcin and the 2013 War Woman Red. We will feature these wines along with 7 of our wines this weekend. So come on out and enjoy weekend with us. Order German Christmas Spiced Wine Now! Holiday Season is Here! It is time to bring out The Captain’s Gluhwein! This year we are taking reservations for your orders of this Holiday Favorite. The Gluhwein will be in the tasting room starting 30 October to close on 2 December. If you would like more than a bottle, please email us with your order and pick-up date. We will require a 50% deposit with your order. Please include a phone # so we can call you for your payment information. All orders will need to be picked up by Dec. 2nd, unless other arrangements are made. Price will be the same as last year, $13.00/ bottle. We give a discount of 5% on six bottles or 10% on 12 or more as always. Again the supply in the tasting room will be limited. Thanks. The Chardonel is Absolutely Perfect! 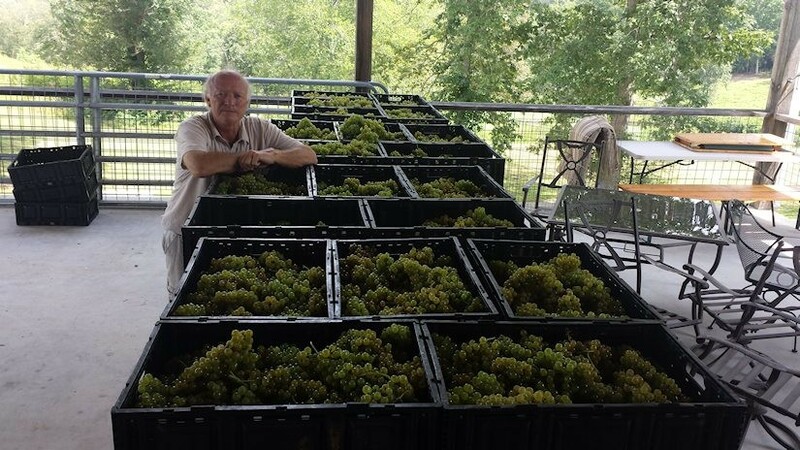 The Chardonel Grapes were the first harvested at Nottely River Valley Vineyards in Murphy, NC for the 2015 Vintage. They are absolutely Perfect!! If you have never tried Chardonel, it is a French hybrid grape with a body and flavor all wine drinkers can appreciate. Excellent alone or, paired with cheese, seafood, chicken, or pork, come out to the vineyard and sample it in our tasting room today. We have been truly blessed with a great growing season so far during the 2015 Vintage. Three blocks of grapes have been harvested, with four more to go. If the weather stays dry, with hot days This will be a Vintage year for the record books. The taste and the analytical analysis of them are stunning. That really makes it difficult as a wine maker. You can easily make a simple mistake and destroy what the vines and the “terroir” provide you. It is a very humbling task to nurture , from juice to finished, aged, bottled wine, with the least influence, allowing the vine to speak to the consumer. So our task is slow, long, and difficult. Cheers!